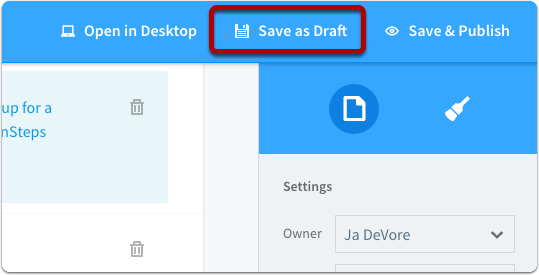 Save changes as a draft if you don't want the changes to appear to the public. Only other authors working on the article will be able to see the changes. If you don't want the changes you made to an article to appear to the general public then click the Save as Draft button when you want to save the changes. The prompt you will see is the same as if you had clicked Save & Publish but the changes will be saved to a draft on the server and will not be visible to the public. When you are ready to make the draft version available to the public you can publish it. 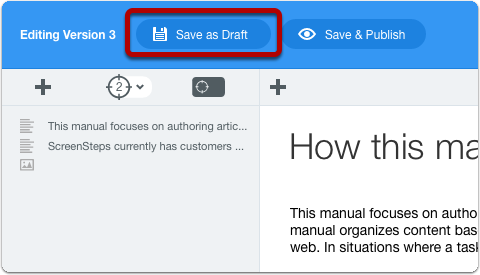 If you don't want the changes you made to an article to appear to the general public then click the Save as Draft button when you want to save the changes to the ScreenSteps server. The prompt you will see is the same as if you had clicked Save & Publish but the changes will be saved to a draft on the server and will not be visible to the public. Prev: What is a draft? Can you confirm that there is no 'public facing' indicator that an article is in draft? Steffan - That is correct. Your end users would not know that there is a draft version of the article. It would be realy usefull to have a functionality to store version numbers in the articles, so that you can distiguish articles releted to different versions.Of course it would then be necessary to be able to select on the version number. That way customers or end users can select the version of the software they're working with. Are you planning on this? Can you Delete a Draft? You can't delete any revisions of an article. If you want the draft to effectively disappear then you would restore the "current" revision of the article. This would make the current version of the article the latest revision which means the article is no longer in draft mode.